Yum! 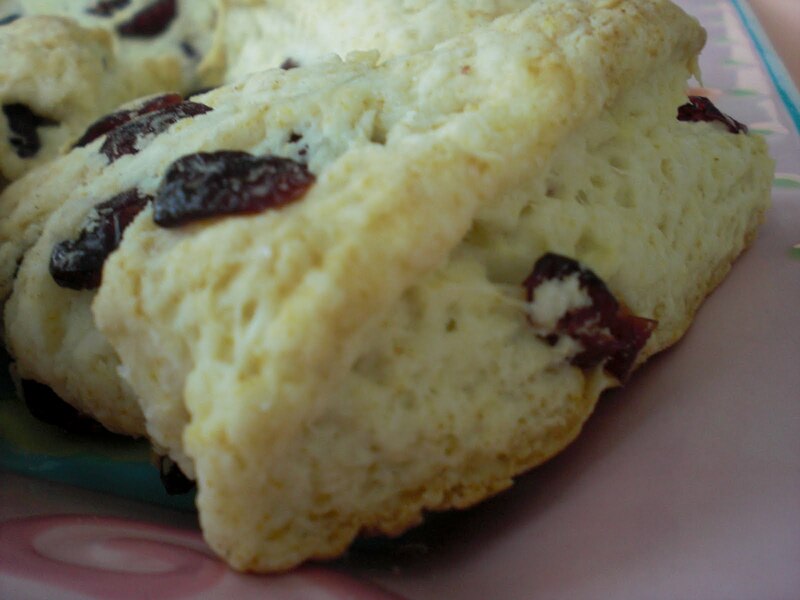 I’ve been craving a good scone, so I have been pulling a ton of interesting recipes. Let me know what you think! In the bowl of an electric mixer fitted with the paddle attachment, mix flour, baking powder, baking soda, salt, and sugar for 30 seconds. Cut the cold butter into small cubes 1/4-1/2 inch. On low speed mix until butter is just coated with flour, leaving large chunks. Stir in the Craisins or Raisins. (Cooks Note: Dried fruits will be improved by a brief soaking in hot water or rum; drain and toss in sugar before adding). Stir in 2/3 cup buttermilk and mix for about 30 seconds, or just until the liquid is absorbed. (The batter will begin to pull away from the sides of the bowl). Using a spatula, scrape the dough down and form it into a ball. Pat the dough together into a flattened circle 3/4-inch thick. Place the circle on a baking sheet lined with parchment paper, a silicone baking sheet or a buttered sheet of wax paper. Divide the circle into eight wedges and separate the wedges out leaving a 1/2-inch space between them. Brush the tops with remaining buttermilk or an egg wash.
Sprinkle with coarse sugar (sanding sugar or turbinado is best for a crisp crust). Serve warm with butter and jam or honey or fruits in syrup. The tops of the scones may be lightly dusted with confectioners sugar, if desired. Preheat oven to 400 degrees. Cut butter into flour, sugar, baking powder, and salt until mixture resembles fine crumbs. Stir in 1 egg, currants and enough half and half so dough leaves the sides of the bowl. Turn dough onto lightly floured surface; knead 10 times. Roll 1/2 inch thick; cut with round or heart shaped cutters. Place on ungreased cookie sheet; brush with beaten eggs. Grease and flour a cookie sheet.Combine the flour, baking powder, and salt in a mixing bowl and blend with a whisk. Cut in butter with a pastry blender or two knives.In a separate bowl beat the eggs; blend in syrup and cream.Make a well in the center of the dry ingredients and add the wet ingredients all at once.Mix in walnuts and stir just enough to blend together.